Welcome to Renee's Crêpes & Cakes! 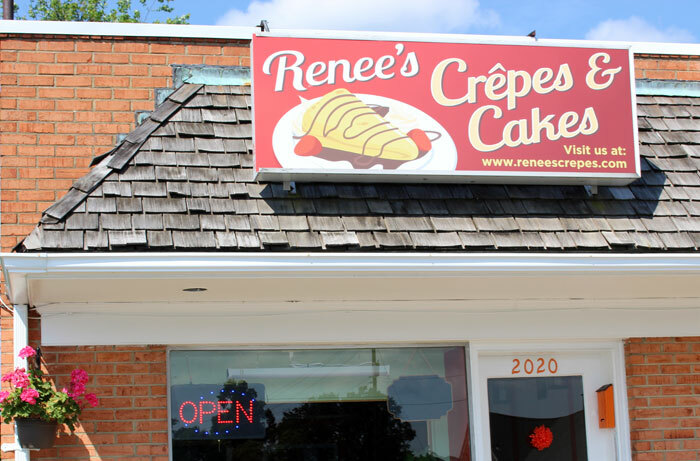 Get your taste buds ready for Renee's Crêpes & Cakes. Honoring French tradition, we make each crepe to order. You can watch as the chef use a wooden paddle to spread the batter evenly across the griddle. Then comes your choice of toppings. From delicious sweet & savory crepes to amazing homemade cakes, sandwiches, salads and soups. There's something for everyone. Bonn-A-Petite! A crêpe is a type of very thin pancake, filled with toppings and fruits! Crêpes have been enjoyed by millions both savory and sweet! We invite you to come try this simple French culinary marvel. If you like pancakes or savory sandwiches, then you should enjoy a crêpe. If not, it's on us, no worries! Find Out More. We are located on 2020 Augustine Ave; just off of Route 1 and the junction with I95. We are within close proximity to the campus of University of Mary Washington and Historic Downtown Fredericksburg. We Are Proud RBBBS Sponsors! Thanks everyone for an amazing Grand Opening! Copyright 2016 Renee's Crêpes & Cakes. All rights reserved.